So it’s International Amiga day 2014! I wasn’t going to post anything, but then I thought to myself, do you know what, a good chunk of my working life was spent in front of an Amiga computer of some sorts during most of the 1990s perhaps a few lines is deserving of a machine I still have fond memories of. I started out with an Amiga A1000 which cost some silly amount but was so worth it as it had a piece of software on it called Dpaint. The grandfather of pixel art software and one I spent many years using creating the art for a lot of my earlier Amiga graphics. I recall seeing the Amiga demos on display and it immediately showed the power this new machine possessed , it was back in the late 80’s light years ahead of the current computers of the time. 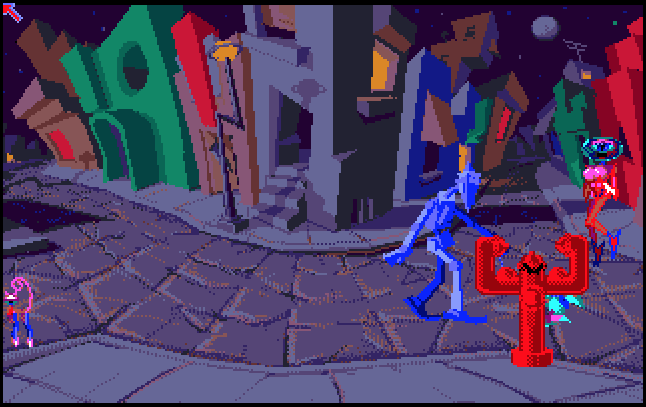 The most famous bouncing ball demo which later became an emblem of Amiga Inc. is one the better known examples but for me the one I remember most fondly was a demo that showed a funky looking street scene with robots walking about, imaginatively titled Robo City. Over the years I’ve owned and worked on most of the Amiga models, which surprisingly I still own, though whether they still work or not is something I’ll have to find out in the future. The last machine I used was an A4000 and absolute wonder of a machine. So to mark the date I’ve knocked up a quick collage of some of my old Amiga art from back in the day. Viva Amiga, you may be gone, but you will never ever be forgotten. Titter ye not for I been mostly usingTwitter ! Over the past few days I’ve been using Twitter. I can certainly see the appeal of quick easy straight to the point updates of information. I registered ages ago but never really got into it, until now! As you can see if you glance over the to the right of this blog I’ve added me last handful of Tweets which is working wonders for my web presence linkage. LOL ‘Tweets!’, see I’m learning the lingo too! After the rewire and attaching of the lights to the desk, power is now back on and my desk is no longer at the mercy of the Master Control Program! When I can source the parts my next trick is to turn the desk into a giant light box to aid my illustration work. It works to a degree at the moment but having white light underneath will give me a much better result. 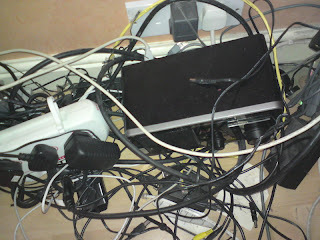 Overted a desk disaster. 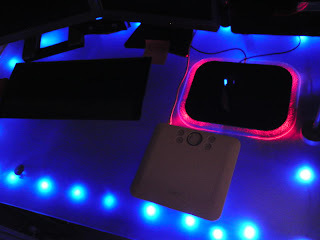 Wire to one of me desk led lights got severed. Works again now. 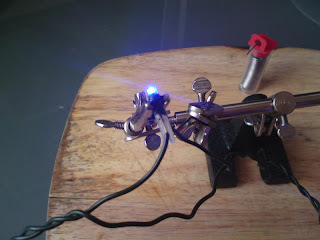 Soldertastic!